As discontent over the Batista coup grew, Castro abandoned his law practice and formed an underground organization of supporters, including his brother, Raúl, and Mario Chanes de Armas. Together they actively plotted to overthrow Batista. They collected guns and ammunition and finalized their plans for an armed attack on Moncada Barracks, Batista's largest garrison outside Santiago de Cuba. On the 26th of July, 1953, they attacked Moncada Barracks. The Céspedes garrison in Bayamo was also attacked as a diversion. The attack proved disastrous and more than sixty of the one-hundred and thirty-five militants involved were killed. Castro and other surviving members of his group managed to escape to a part of the rugged Sierra Maestra mountains east of Santiago where they were eventually discovered and captured. Although there is disagreement over why Castro and his brother, Raúl, were not executed on capture as many of their fellow militants were, there is evidence that an officer recognized Castro from his university days and treated the captured rebels compassionately, despite the 'illegal' unofficial order to have the leader executed. Others, such as Angel Prado, military commander of the 26th of July Movement, say that on the night of the attack Castro's driver got lost and he never reached the barracks. That night was the night of “El Carnaval de Santiago” and the streets of Santiago de Cuba were filled with party goers. The Moncada Barracks, near Santiago de Cuba, was the site of an attack by guerillas that sparked the Cuban Revolution. On July 26, 1953, Fidel and Raúl Castro lead 160 poorly-armed and perhaps overeager guerillas in an attack on dictator Fulgencio Batista's second largest fortress in Cuba, headquarters of the 1,000 strong Maceo regiment. The night before the attack, the guerillas stole some army uniforms. Their plan was to take the barracks, including the radio transmitter within it, and use it as a centre from which to broadcast propaganda to the Cuban people. However, the attack began poorly. Already outnumbered more than 10 to 1, many of the rebels who would have taken part in the attack had to be left behind for a lack of weapons, and the car carrying the guerillas' heavy weapons got lost. 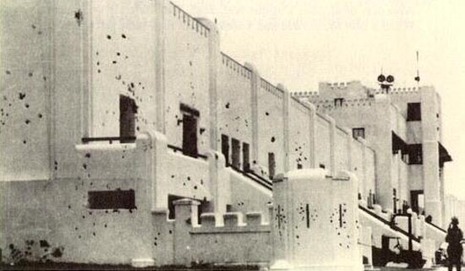 When it was finally carried out, the attack on the Moncada Barracks was a total disaster. Sixty-one rebels were killed in the fighting, and one third of the guerillas, including Fidel Castro, were captured. Half of the men captured were tortured to death. Castro, a lawyer, defended himself at his trial. His defense speech, "Sentence me, it does not matter: history will absolve me", was written down by a court reporter and later frequently used in Castro's speeches. Castro was sentenced to death; however, at the urging of Catholic priests, Batista abolished the death penalty just before Castro's execution, and he was sentenced instead to fifteen years in prison. Two years later, in 1955, a group of prisoners' mothers launched a campaign to free Castro and the other guerillas imprisoned with him. A group of political leaders, editors, and intellectuals signed a public appeal demanding "liberty for the political prisoners". The Cuban Congress passed an amnesty bill that year; Batista signed it, and the imprisoned guerillas were freed. The date on which the attack took place, July 26, was adopted by Castro as the name for his revolutionary movement that would, in 1959, take power in Cuba.